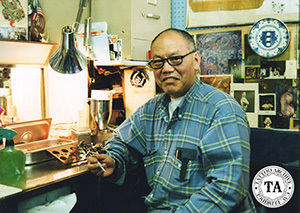 Pinky Yun (1927-2010) aka Bing Kuan, is about as close to being a living legend in the tattoo world as we can get. Born October 29th in Shanghai, China, Pinky first learned hand tattooing. After the Communists took over in 1949, Pinky moved to Hong Kong. Throughout the years Pinky operated shops in Kowloon, Macao, Taiwan, and he tattooed in Japan during the Korean War. Pinky moved to the United States in 1972 and opened a shop in Alameda, California and later moved to San Jose. To read some great interviews with Pinky, see Tattootime #3 and Skin & Ink Magazine, July 2000.